of their thirtieth revolution around the Moon. The second was in case the SPS engine failed to light at the first opportunity, in the hope that it would light next time around. Aldrin wrote all this in the standard P30 form, and then read it back to Duke to ensure that he had copied it down correctly. They then repeated the process for the contingency PAD. The flight controllers in the MOCR were polled by flight director Gene Kranz about whether, within their area of responsibility, they were happy for Apollo 11 to go ahead with the upcoming burn. 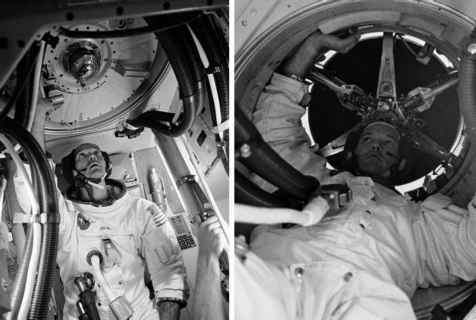 When a unanimously positive response was gathered, Kranz directed Duke to inform the crew. "Apollo 11, Houston," called Duke. "You are Go for TEI.'' Eight minutes later, Columbia disappeared behind the Moon for the last time. In the following translation of this PAD, some details have been glossed over. Readers should consult the fuller explanation of the PAD for LOI given in Chapter 8. TEI-30, SPS/G&N - As usual, the initial statement gave the purpose of the burn (to perform a trans-Earth injection manoeuvre), which propulsion system was to be used (the big rocket engine sticking out of the back end of the spacecraft) and the system that was to control it (the guidance and navigation system). The CSM was expected to weigh 36,691 pounds (16,643 kilograms) at ignition. Prior to the burn, the engine nozzle was to be aimed to act through the spacecraft's calculated centre of gravity, in this case, minus 0.61 degrees and plus 0.66 degrees. This was only an initial setting to minimise attitude excursions at ignition. Once the engine was burning, the computer took control of the nozzle, swivelling it as necessary to keep it properly aimed while the spacecraft's centre of gravity shifted. The nine-digit number - 135234156 - represented the ignition time. This was 135 hours, 23 minutes, 41.56 seconds into the mission. For such an unwieldy collection of data, Noun 81: plus 32011, plus 06818, minus 02650 was pretty simple, representing the change in velocity that the burn was expected to impart on the spacecraft, expressed in tenths of feet per second. As is normal in the spaceflight realm, the total velocity change was broken down into three orthogonal vectors given with respect to the local vertical/local horizontal frame of reference, and were entered into the computer under the name 'Noun 81'. It is plain that the largest component of the burn was positive in the x axis, 3,201.1 feet per second (975.7 metres per second), which shows that the burn was largely along their direction of motion. There was also a substantial component, 681.8 feet per second (207.8 metres per second), that acted out of plane, the y axis, which pushed the spacecraft slightly south of their original orbital plane. The smallest component, 265 feet per second (80.8 metres per second), acted opposite the z axis which meant it acted away from the centre of the Moon. The numbers 181, 054 and 014 represented the required attitude of the spacecraft. The figures are angles given with respect to the orientation of the guidance platform. It is interesting to note that these attitude numbers appear rather arbitrary - a fact that illustrates the development of Apollo's procedures. For all flights to the Moon, the burn to enter lunar orbit, LOI, was performed with the platform aligned to an orientation that coincided in some way with their expected attitude for the burn. This made the FDAI displays easier to interpret. For TEI on Apollo 11, the platform is still oriented according to the 'lift-off REFSMMAT'. In other words, the attitude angles given represent the attitude that the spacecraft should adopt for TEI as expressed relative to the orientation of Eagle's landing site at the time of its lift-off from the surface. Although later missions used coincident REFSMMATs for TEI in the same fashion as for LOI, the idea was not considered so important for the early missions in view of the fact that, at TEI, the spacecraft was increasing its speed, and thereby would be rising away from the surface and not be in danger of crashing. Apogee is N/A, perigee plus 00230 gave the expected size of the orbit that resulted from the burn, stated in nautical miles. These were given with respect to Earth. Since the spacecraft was coming all the way from the Moon, the apogee figure would be meaningless. The figure of 23 nautical miles given for perigee represents about 43 kilometres and was really a theoretical figure. Any spacecraft that approaches Earth on an orbit with a 43-kilometre perigee is destined to enter the atmosphere, be slowed, and most likely burn up if not protected. This is a very good figure. The total velocity change, delta-vt, of 32836 was to be imparted by the engine along the plus-x direction, given in tenths of feet per second. As such, it is really the vector sum of the three component velocities given earlier. It represents almost exactly a speed increase of 1 kilometre per second. The number, 228, was the expected duration of the burn: 2 minutes, 28 seconds. The crew would keep an eye on this and make sure that if the automatic systems failed to shut down the engine around this time, they would do it manually soon after. The velocity change figure, known as delta-vc, of 32628 was very much like delta-vt, the main difference being that it was for the EMS digital display that provided a backup method of shutting down the engine. The EMS was a less sophisticated method of ending the burn as it could not account for the tail-off thrust that an engine has after shutdown, whereas this could be done with the primary system. Therefore, to account for this the controllers reduced the figure slightly. The numbers 24, 1511 and 357 were to provide a check of their attitude. The star designated by the octal number 24 (Gienah, or Gamma Corvi) should be visible through the sextant when its shaft angle had been set to 151.1 degrees and its trunnion angle to 35.7 degrees. At the start of Apollo operations, mission control standardised the software and associated forms for PADs like this one for P30, and it included two methods of checking their attitude. The remark that the next three lines are N/A, reflected the fact that the spacecraft's windows were facing the Moon, and therefore, the COAS could not be used to sight on a star. Noun 61 in the computer held the latitude and longitude of the planned landing site on Earth in geodetic coordinates. Therefore Noun 61; plus 1103, minus 17237 indicated that the target was in the mid-Pacific Ocean at 11.03°N, 172.37°W. Given in tenths of a nautical mile, 11806 was the distance the command module was to travel between entering Earth's atmosphere and landing. It is equivalent to 2,186.4 kilometres. When it entered the atmosphere, the CM was expected to be travelling at 36,275 feet per second or slightly over 11 kilometres per second. Mission control expected that, upon entering the atmosphere, the crew and spacecraft would sense one-twentieth of 1 g at 195 hours, 4 minutes, 52 seconds mission elapsed time. The crew's backup method of determining their attitude reference, should they lose the platform, required that they align the stars Deneb and Vega in the telescope eyepiece in a prescribed way. If they were to do this, their attitude would be given as: 242 degrees in roll, 172 degrees in pitch and 12 degrees in yaw. The remainder of the PAD consisted of notes pertaining to the burn. An ullage burn prior to the TEI burn itself was required to settle the propellants to the bottom of the large tanks in the service module. The burn was to be made using two of the four rearward-facing RCS thrusters for 16 seconds. As a quick check prior to the burn, 2 minutes before ignition they should expect to see the Moon's horizon aligned with the 10-degree mark in the forward-facing rendezvous window. Finally, mission control were informing them that they could not make their check with the sextant too early because the star they were to use would not rise above the Moon's horizon until about half and hour before the burn.